Just like asking if apple or orange juice is better, asking if tracks or tires are better systems comes down to customer preference. Both systems have pros and cons, so it is important to understand the facts and benefits about each system and determine which is best for your operation. In many operations, it could be a combination of both systems. If the inflation pressure of the tires is less than 20 psi, tires transmit less contact pressure to the soil compared to tracks. From 20 to 35 psi, the tracks and wheel systems were comparable. If the inflation pressure of the tires are above 35 psi, the track system had lower contact pressure than the tires. 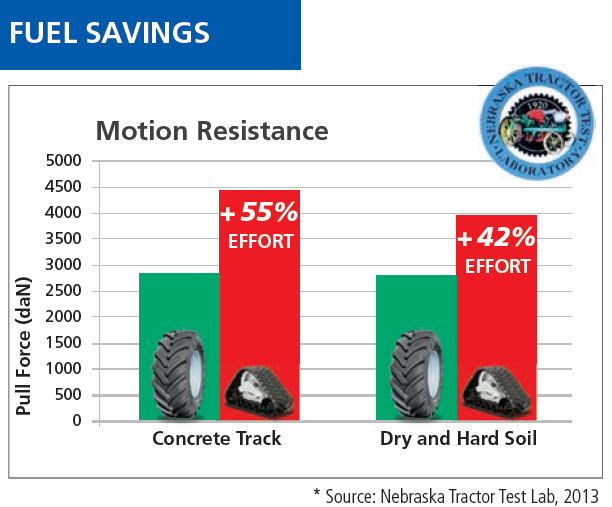 However, there is still the perception that tracks reduce soil compaction when compared to tires, in all situations. What we have heard, anecdotally, is that the absence of a rut in the field means there must be no compaction. In wet soils, it does not matter which system is being used – compaction occurs with or without ruts. The rutting is a function on how the wheel and track system operate differently. A tire rotates and the tire lug needs to pull the tractor forward. The rotation of the tire causes a wave in front of the tire, and the tire is climbing out of the rut in wet soils. The lug on the track system is planted in the soil and the tractor is pushed forward. With the track system there is not a wave of soil, so the track lug isn’t trying to climb out of a rut. 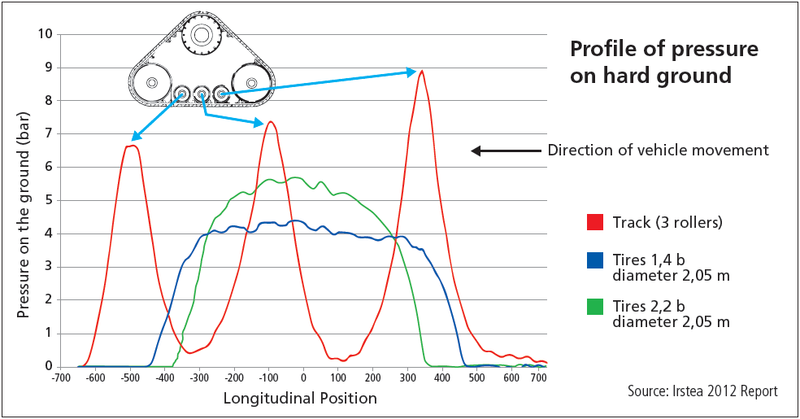 When looking at traction, track systems are most efficient at 0 – 3% slip while wheeled systems are most efficient at 5 – 9% slip. The lower slip range of the track system does give users more traction in the field, but that does not result in less fuel used. A track system takes more horsepower to rotate the track, which results in higher fuel consumption. When comparing a tracked tractor to a comparable wheeled tractor with the proper inflation pressure, they both will use similar amounts of fuel to complete a task. If the tires on the wheeled tractor are over inflated, that tractor will not develop the proper footprint, which results in less traction. In this scenario, a tracked tractor would use less fuel. For traction and fuel usage, both tractors will have similar fuel costs. When transporting tractors on the road, a wheeled tractor can operate in the 25 to 30 mph range, while tracked machines are limited to 20 mph. The faster road speeds are better for minimizing wasted time between fields. However, the narrower width of a tracked tractor makes driving on the road less stressful compared to a 4WD tractor with duals, especially in areas of the country where roads may only be 15 feet wide. The last item a customer should consider would be total cost of ownership. Typically, a tracked tractor will cost more to purchase versus a similarly equipped wheeled tractor. Both systems require regular maintenance during the life of the tractor. For a tracked machine, it is important to make sure the track tension is set correctly and boggy wheels are greased or oil levels are maintained. On wheeled tractors, the inflation pressure must be set based on the axle load and maintained when operating the tractor. If the tractors are driven over abrasive stubble (corn or cotton), both tracks and tires will experience stubble damage. The track system has an advantage of not going flat because of punctures, but exposing the steel in the tracks still requires replacing the tracks, just like seeing the cords in a tire. In the end, it comes down to what system works for a farm. Both systems will work similarly in most situations. If a farm is width-restricted or needs to operate in wet soil conditions, a track system may be the best fit. If an operation wants to minimize upfront costs and is able to match axle load to inflation pressures, the wheeled system may be the best fit. Remember that compaction will occur in wet soils regardless what kind of system is running. Firestone Ag has experts and engineers available to help customers understand the pros and cons of both systems, as well as what Firestone products will work best in either system. Throughout my travels across North America, in all types of farming environments and soil types, I like to ask track owners their thoughts and how they justify the additional expense for track machines. In all but one instance that I can recall, the owner will drill down to, “its’s my insurance policy,” meaning, their tracks give them the perception of superior traction, pulling power, and/or flotation (which is commonly confused with the reduction of soil compaction). A grower in central Iowa told me tracks require less effort to guide straight down the rows. But at what cost? Tracks have only one advantage over tires: traction in very wet soil. In these conditions, however, their impact on the soil, in terms of compaction, does the most damage. A Machine fitted with Michelin VF tires at proper air pressures has very comparable traction- with reduced compaction. With Michelin’s recent acquisition of two CTIS (Central Tire Inflation System) companies, PTG and Teleflow, the playing field has begun to level out. Additionally, although all Michelin tires perform very well with CTIS, we have brought a new VF Axiobib and VF Evobib to the market, specifically marked as “Tire Inflation Ready,” designed to be used with CTIS. Now, instead of setting air pressures for the machine’s highest carrying capacity at the fastest speed, the user can set multiple air pressures. In some cases, this means 6 psi in the field is an option with just the push of a button. In turn, with these CTIS ready tires, traction is maximized with minimal costs compared to the purchase and maintenance of a track machine. The next question to ask is at what point is the soil too wet? Have you ever seen a track machine sink in the middle of a very wet field? Many of us have! Fuel Economy is another major disadvantage of tracks. Have you ever watched and listened to the exhaust stack of a quad track as it pulls a large implement through the field? The amount of fuel these track machines can consume over a short distance is incredible! For every 100 Hp of power transmitted, tracks can only deliver about 70 Hp, whereas tires will deliver up to 90 Hp. Additionally, when a machine is fitted with pneumatic tires vs tracks, a comparable machine weighs about 3 tons less with far fewer moving parts/mechanisms, requiring less energy to move the tire machine forward. Pneumatic tires will transmit up to 29% more power to the ground and are 4 times better at overcoming rolling resistance, making that power available for use elsewhere (i.e. fuel savings). When Roading, track machines are typically limited to the speed in which they can travel roads based upon the width and length of the track they are running. You will usually find a manufacturer recommends a top speed or the machine is governed to prevent damage to the tracks. Due to the amount of movement from bogie wheels and the mechanisms required to move the machine on tracks, heat builds up in the rubber of the track. The downward force/weight of each of these will also cause the rubber to deform/move. The more rubber squirms, compresses, decompresses, the more kinetic energy builds up and creates heat. Heat and rubber do not mix well and ultimately causes the rubber to break down. We believe Soil Compaction is the greatest of all costs associated with tracks; especially in very wet soil. In fact, tests have shown tracks have a significant difference in how ground pressure is applied. Tracks apply a very non-uniform pressure, while tires, specifically IF & VF tires, apply a very even/uniform pressure. In fact, each roller (on a three roller track per the example) can apply as much as 50% more ground pressure, which translates to deep compaction. To be clear, tracks have a market, and depending on the region, farmers may want to achieve different results. However, for most of North America, when you add the initial financial cost, fuel cost, maintenance, lower yield due to soil compaction, and less efficiency on the road, choosing tracks over properly inflated IF or VF tires is a very costly “insurance policy.” In the end, what are you trying to gain? At Alliance, we have invested ourselves completely in the development and sale of pneumatic agriculture tires because that is what we believe is the correct solution for providing the best overall performance for farm equipment. Sure, there are applications and field conditions that may lend themselves to belts, but the upfront cost as well as the maintenance costs make it tough to justify even in those conditions. We are continuously expanding our Agriflex line to provide the optimal solution for farmers. Our Agriflex product offer consists of our IF and VF products which are the best available in reducing compaction and maximizing traction. A properly inflated VF tire will give any track system a run for its money. To maximize the benefit of VF technology, or even standard radials, the tires must be run at the correct inflation pressure. The more a tire is overinflated, the lesser the potential performance will be. As a tire increases past its optimal inflation pressure, the footprint gets smaller both in length and eventually in width, while a properly inflated tire will provide the largest footprint available for that sized tire. Footprint is often where people assume a track has an advantage. This may not be completely true. A pneumatic tire, when inflated properly, will evenly distribute the load of the machine throughout the contact area or footprint. This even weight distribution minimizes the damage done to the soil. Tracks are not known for their even weight distribution and instead provide high pressure spots under the idlers or dollies that cause what is known as deep compaction and assist in the creation of hard pan deep under the surface. Since their spike in popularity, tracks have been researched extensively to try to better understand what actually happens under them in relation to that of a tire. Research from the University of Minnesota supports the theory that a properly inflated tire will offer less compaction than a track. Versatility is another strong benefit of tires over tracks. One of the driving forces in Alliance’s R&D program is creating tires that can tackle any challenge—creating the right tire for the job. Tracks are basically a one-solution approach. In rubber tracks, you’ve got your classic lug or some minor variations that are very close to that theme. In steel tracks, you’ve got perpendicular grousers. Period. If you search out the right tire, you can find plenty of options—thousands of them. Different combinations of width and height to get the footprint you want. Sidewall technologies ranging from sturdy, stiff bias-ply sidewalls to VF sidewalls that extend your footprint and your load capacity even further. And tread designs that are optimized for different soil types or conditions, paved worksites, over-the-road travel, gravel and rock—literally every possible situation you may be running in. Upfront and long term cost is another huge issue with tracks. A new machine equipped with a four-track system will cost over 20% more than a machine with pneumatic tires. This is an upfront cost that likely won’t be recoverable upon trade either. When the belts wear out, the idlers will also likely need to be retreaded or replaced. On a day-to-day level, it’s also important to note that optimizing inflation pressure to maximize performance is a simple task, and choosing the right tire is as simple as working with a knowledgeable tire dealer. So is changing a tire, something most farmers and certainly any dealer with a decent service truck can do in minutes. Tires don’t require the extensive (and expensive) undercarriage maintenance that track systems do. The bottom line is that a new set of tracks will come with a significantly larger price tag than that of a brand new set of Alliance Agriflex+ VF tires. As a broad portfolio provider, Continental offers both rubber track and tires for a complete agriculture solution. To help customers make the right product choice, we have a team of experienced field engineers who visit and consult with customers in the field, as every application is different. Tires are suited for customers looking for an economic option with low purchase and maintenance costs. The low rolling resistance of tires also leads to lower fuel consumption and provides higher transport speeds than rubber tracks. They have low heat buildup while roading and can be driven loaded and unloaded on both roads and fields, providing versatility in field and on road performance. The carcasses of Continental agriculture tires are constructed with N.flex technology. The patent-pending material is flexible enough to absorb impact and then return to its original shape without permanent deformation. With tread patterns that have been engineered for efficiency, Continental tires can run on hard and smooth surfaces with high traction, meeting the challenge of smooth roads, rocky lanes, and muddy fields. Continental Trackman rubber tracks, constructed for the most severe and extreme applications, provide the user more transfer torque to the ground, greater traction, and all with more flotation because of the larger foot-print. This foot-print allows the machine/equipment weight to be distributed across a greater area and lowers the ground pressure, thus reducing ground compaction equating to greater crop yields in most applications. To improve track machine ride, we developed the guide-lug support system called ARMORLUG®, Anti-Vibration Technology® that reduces tractor vibration. To reduce stubble damage, we have MAXXTUFF™ wire ply construction providing more ends per inch, and to improve traction, we have the patented ARMORLUG® ULTRA that provides 25% more torque capability than before. There has been – and will be for a long time – the debate over which system is better “Tires or Tracks.” Both sides have advocates, both systems have advantages/disadvantages that will have a strong influence on the selection of one system over the other. Most important, this decision depends strongly on the use and soil conditions of each farm. We also have to consider the money the farmer obtains by selling his production and the cost of inputs needed to produce the crops. Tires don’t have moving parts, but tracks have a lot of them. Moving parts means maintenance and wear. Depending on working conditions and the quality of maintenance this wear could increase rapidly. The cost of a set of replacement rubber tracks is significantly higher than replacing a set of tires. This is particularly significant on harder ground, as lugs on the tracks are not as flexible as the lugs on tires. Changing tread spacing or from flotation to row crop with tires is no issue. Track systems normally don’t allow tread spacing or track width changes, as the complete system must be changed. Units with tracks are generally slower in transport mode than units equipped with tires. This is especially important for farmers with their farming ground spread out, traveling long distances between fields. Track systems are heavier than tires, increasing the “death weight” the tractor must spend power without working, and reducing available horsepower for the real work. Tires provide a smoother ride on hard surfaces or roads thanks to the cushioning the air inside the tires provides. On the other hand, tracks can provide a smoother ride on rough fields (specially when traveling across the rows). The tracks – due to their longer contact area – can bridge over ruts. However, when crossing ditches, waterways or small hills, this bridging effect of tracks is less adaptative than tires, reducing temporary the contact area, will teeter forward and drop down on top of the road surface or field. Track tractors are more maneuverable at the end of the rows as they can counter-rotate, providing the possibility of a zero turn on the spot. This maneuver will create berming when turning on end rows and the farmer will need to level this area before planting (additional time-consuming labor). There is also the risk to jackknife the tractor into the implement when turning sharp on end rows with an implement that is hooked to the drawbar. There is more care and precaution to be taken with track units. The flexing property of the tires helps improve the self-cleaning during labor in higher moisture conditions. One large advantage of tracks is as they don’t have air, they can’t go flat like tires. There has been a lot of discussion and studies about compaction comparisons between tires and tracks. Remember, there are two kinds of compaction. The superficial (what we see on the ground) is related directly to the pressure per contact area (total weight of the equipment divided by the contact area between soil and tires or tracks). The second compaction is the sub superficial (we don’t see because it’s beneath the ground) that is directly related to the weight per axle – independent of the contact area of the tires or tracks. With superficial compaction, the general assumption is that tracks provide a lower superficial compaction as there is more surface contact with the ground compared with tires. This idea would be correct if the pressure (total tractor weight) was distributed uniformly on the complete contact surface of the track with the ground. Studies have shown, however, that this assumption is not the case and that the largest pressure occurs on the drive wheel and there is very little pressure applied in between the dolly wheels. With this in mind, and assuming that “if” a track has “X” times larger contact area as the comparable tire set on a tractor, the superficial compaction is “X” times lower – that’s not the case. Last but not least (and the most controversial point of all) – which is more efficient in terms of traction and fuel consumption. This answer will be influenced directly by each point of view, soil type and condition, equipment in comparison, weight of the equipment, and equipment configuration. The only way to make a fair comparison is to have the same equipment (one on tires and the other on tires) correctly set up, on the same field and conditions. The debate between tires versus rubber tracks is ongoing. A lot depends on where and when you are using the equipment. It also depends on gaining flotation and traction in wet ground or reduced ground disturbance and traction in dry dirt. The main difference between tracks and tires is how they distribute weight, and how this benefits you. Tires have footprints that contact the ground during the revolution of the tire. The machine’s weight has to be transferred evenly to the ground during these revolutions. The larger the footprint of the tire, the more evenly the weight is distributed, and the less ground bearing pressure it delivers. Tracks have a much greater ground contact area that reduces the tractor weight transfer to the ground. Thus, in theory tracks delivers less pounds per square inch (PSI) of ground bearing pressure than tires. The points of contact of the bogey wheels and drive wheels increase this some. In terms of traction, tracks work better in wet soil. Tires do as well or better in dry soil. Tracks tend to float across the ground in wet dirt, thus not creating ruts. Tires have to work a little harder in wet soil, and can leave ruts. With the advent of IF and VF tires, you can run lower air pressures to give more foot print, traction, and flotation. In terms of fuel economy, tracks are designed to work with about 5% slippage. Tire are designed to work with between 8% and 15% slippage, with closer to 8% being optimum. Tracks are possibly a little more fuel efficient with less slippage factored in, but there are other factors to consider, such as the cost of operating and maintaining tracks. Soil compaction has to be considered when using either one. On average, tracks deliver about 4-8 psi of ground bearing pressure to the soil when parked. This can change some when the tractor is under a drawbar load, and because of track stiffness. The points of contact with the drive wheels and bogey wheels increases this some. Radial tractor tires generally have 1-2 psi higher than their inflation pressure. IF (Increased Flexion), and VF (Very Increased Flexion) tires were developed to carry the same weight as standard tires with lower air pressures. IF tires will carry 20% more weight at the same air pressure as a standard tire, and VF tires will carry 40% more weight than a standard tire at the same air pressures. If you can run 6-8 psi of air in tires, you are pretty close to tracks. Tracked tractor suspensions have gotten much better from the early days of tracks. They are more comfortable to drive on the road. While the track manufacturers have much better compounds, there is a lot of set up with the undercarriages for a track installation including alignment, and lubrication. Tires still seem to work better when a farmer has to move equipment around from farm to farm. Although agricultural tires are not specifically made to run on the road, they still deliver more hours than tracks. So, which is better? Tracks definitely have an advantage in wet soil. You have heard the old adage, “if it’s too wet in the field, stay out.” Sometimes that is not reality, as crops have to be taken out of the field in the fall, no matter the weather or conditions. This is the purpose of tracks on combines and grain carts. In dry dirt, tires and tracks are pretty close, as far as traction and soil compaction are concerned. The more serious question is the cost of operating tracks or tires. Although the price of tracks have come down a little, they are still expensive. The cost of maintaining the suspension on tracks is expensive compared to a tractor with tires. On a tractor with tires, you basically only have to worry about tires, wheels, and hubs. There are many more moving parts on a tractor with tracks. While there are advantages and disadvantages to both, a farmer has to decide what is best for his farm, and what costs he can live with. Tracks vs. Tires has been an ongoing debate in the ag industry for many years. Depending on what side of the fence you are on each can make the case. But it really boils down to cost. Fact is, tracks although they do a fine job in certain applications, the cost to own and operate always catches up with the end user. From initial purchase cost, ($60K to $100K) more for a track machine over a wheeled machine of the same horsepower, to the inevitable maintenance cost on the tracks which includes not only parts but time to continually lubricate and adjust. There have been numerous studies that show advantages to both for traction and flotation again depending on the source. When it comes to compaction the idea that a track has an advantage is a bit of an misnomer. Flotation and compaction are two different conversations. In studies, it has been proven that track machines actually have higher ground bearing pressures than a wheeled machine with correctly inflated tires. Tracks machines tend to be heavier than their wheeled counterpart. That load is being carried and is concentrated on the bogies and idlers in the track itself not equally distributed across the track. Since a tire has an air chamber the load is distributed more evenly across the footprint. With the release of the Goodyear LSW1250/35R46 and the LSW1400/30R46 it has become apparent that a wheeled machine can match the flotation of a track machine with all the advantages of a wheeled machine like higher road speeds with unlimited durations. Pulling power is identical between the two when tractors are properly ballasted. We are seeing a major trend moving away from tracks and to the super singles going on in the market place. OE’s are evaluating and will most likely be offering them in the very near future, and we are looking forward to leading the market with our super single tire innovation.